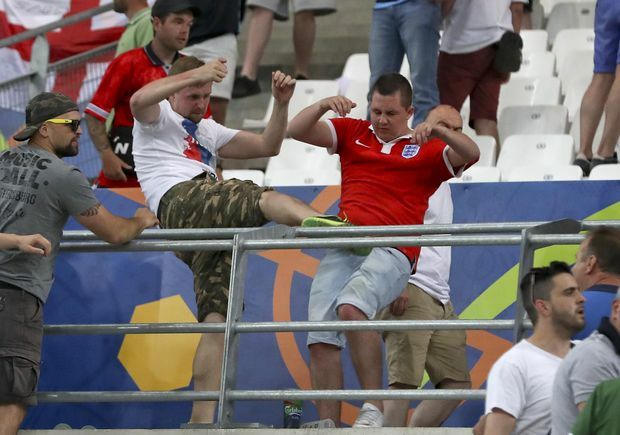 In this file photo taken on June 11, 2016, clashes break out in the stands during the Euro 2016 Group B soccer match between England and Russia at the Velodrome stadium in Marseille, France. At their peak, Russian hooligans felt like gods. Speaking on condition of anonymity to describe numerous illegal acts, he said he travelled to Marseille in 2016 specifically to take part in fights with the English at the European Championships. England’s hooligans of the 1980s and 1990s inspired many Russian groups – most still bear English names – but in Marseille the Russians wanted to snuff out that reputation. World Cup tickets are worthless without a Russian government-issue “Fan ID.” Applicants are vetted by the Russian security services, who have denied several thousand Russian fans ID to see games at the World Cup and last year’s Confederations Cup, according to Oleg Semyonov, formerly a leader of the Spartak Moscow fan scene, who now runs a legal advice hotline for supporters. Semyonov says authorities are using “a big database” to exclude people accused of taking part in football-related disorder – including Shprygin, whose ID was cancelled two hours before a Confederations Cup game – but also some with convictions dating back 20 years for minor offences like jaywalking or public drunkenness.